AAA: Speed Camera Ticketing Decreasing in D.C. Speed Camera Tickets Drop in DC; Spike in Montgomery Co.
AAA Mid-Atlantic is reporting speed camera tickets plunged last year in D.C. compared to prior years, but spiked in Montgomery County. 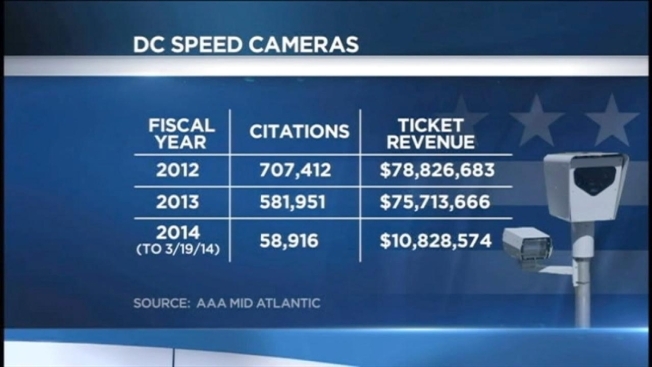 The company says D.C. speed camera tickets plunged from 707,412 in 2012 to 58,916 through March 19, 2014 -- a revenue difference of nearly $68 million in revenue. "We are seeing a precipitous drop in some locations speed camera violations, and in many cases, revenue," John Townsend with AAA Mid-Atlantic said. Townsend calls it the "halo effect." "The halo is they behave like angels when they think the camera is spotting them and once they are out of their range they speed again," he explained. The effect is opposite in Montgomery County, where more tickets are being issued and revenue is growing. County police say they have been "strategic" in placing portable speed cameras in different areas so that drivers don't get used to a specific location. D.C. police tell News4 they are thrilled with the numbers, which they say shows people are simply being safer.